Sheffield artist, illustrator & maker. Every year one of Europe’s biggest steampunk events takes place in Lincoln, bringing together over 30,000 steampunks from across the world to enjoy four days of music, art, costume, gin, tea and silliness. One of the many events is the Great Exhibition, a chance for those taking part to share, if they dare, their creations with an admittedly sympathetic audience. Unfortunately, I suspect that steampunks are mostly shy and strangely introverted for a bunch of friendly and weirdly dressed people! This year’s great exhibition contained just four paintings with the result that I won again. I win something every year and I say that with no sense of pride as I am often the only 2d artist to take part! This year, in a bid to save my blushes and perhaps encourage someone, anyone! else to enter next year, I did four paintings in three different styles. I know his art is kitsch but he was very good at it indeed and he inspired so many thousands of people to pick up a paintbrush that it is rude to dwell too long on any failings his art might have. As with all art, try copying a piece and you will learn something! 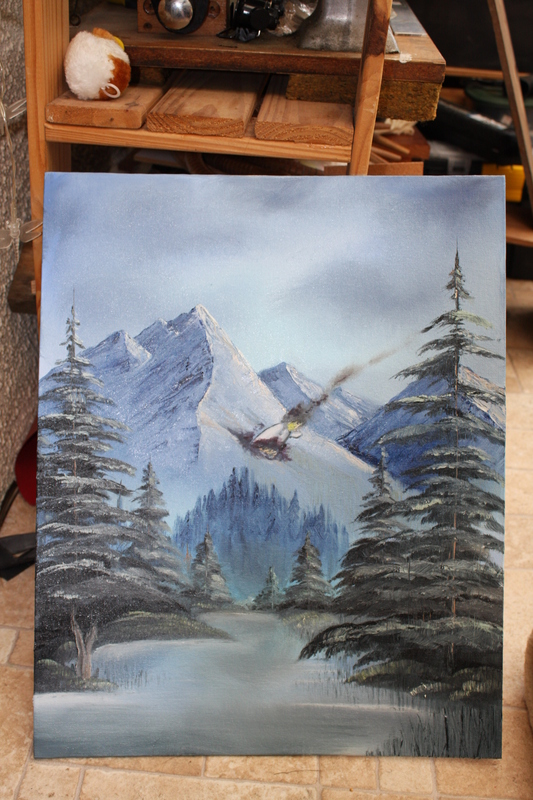 That’s why I painted my second piece: Sanctuary. 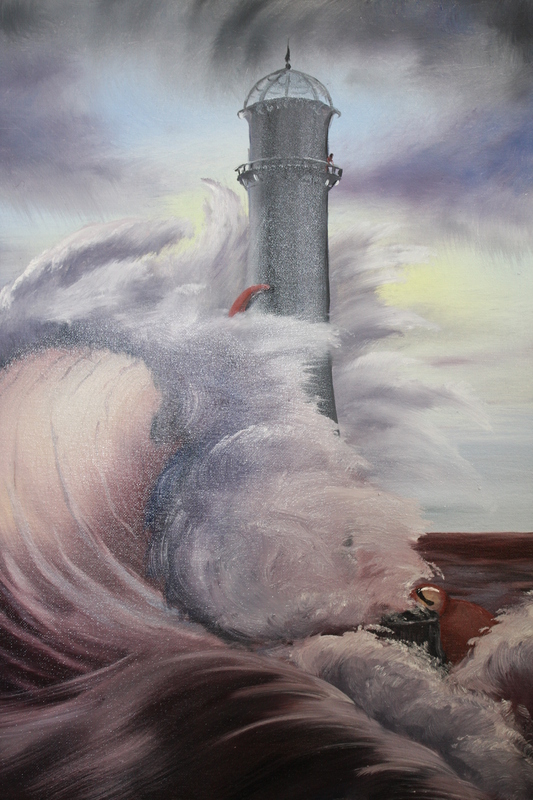 There is no pun involved, I just wanted to draw a Bob Ross wave, do it a little bigger and throw in a lighthouse and giant octopus. I think it would look rather good as a steampunk book cover, don’t you? Margaret Olive Catherine Keen has become known for her pictures of big eyed waifs. In the 1960s the paintings , often derided as kitsch by art critics, were attributed to her husband, Phil Estein but following a bitter separation in 1970 she accepted the blame as part of a wide ranging divorce settlement. In return for taking responsibility for the art, she walked away with the house, car, narrow boat and the couple’s beloved pet cephalopod . 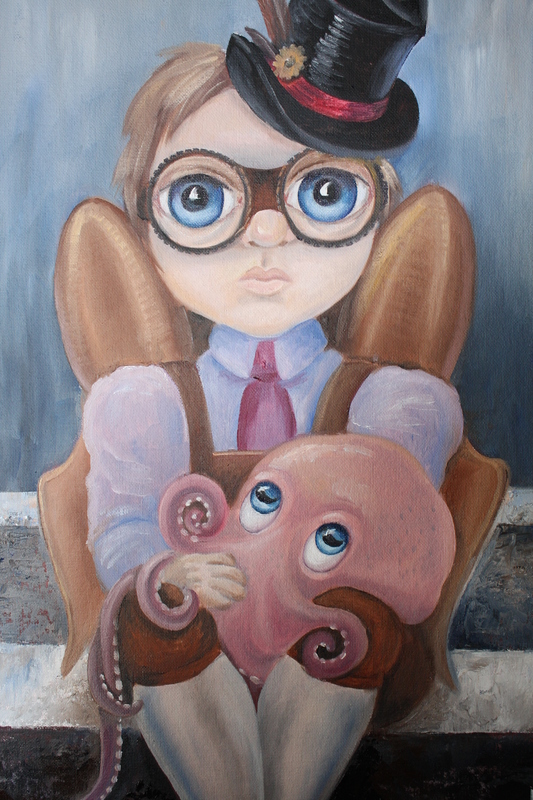 This painting is thought to date from the early 1970s and could be an attempt by Maggie to explain away the ridiculously big eyes by the addition of goggles. No explanation has yet been found for the goggles. Yes, I find it easy to mock but once again I would like to add the caveat that every artist has something to teach and she did well for herself in the end so If you like her art just go ahead and say so and ignore all those sneery critics! Both the winning piece and Big Goggles went into a charity auction at the end of the event and raised £95 for charity so I sincerely hope the buyers did like the paintings and will enjoy them. 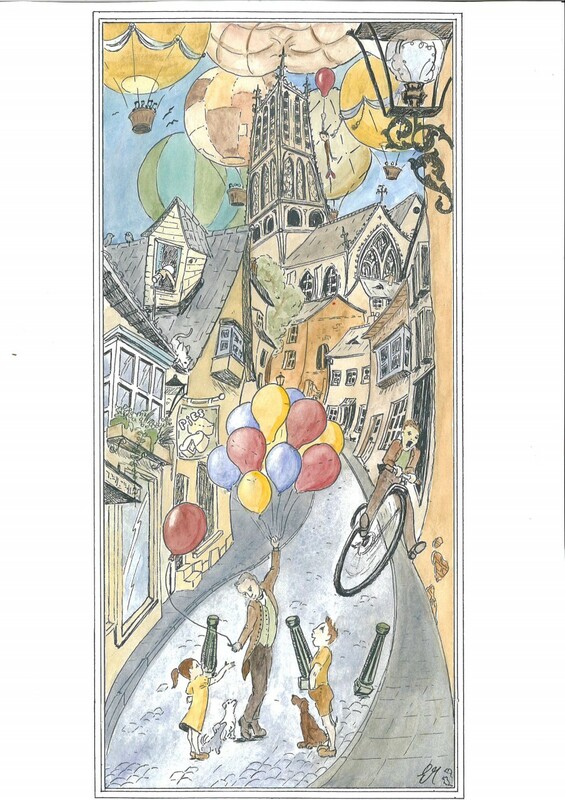 The final piece was simply a little cartoony picture of steep hill in Lincoln with a backdrop of air balloons. I had thought to make it into postcards to sell but I ran out of time so it just went in to make up the numbers. It is a scene I want to return to at some point though, perhaps in a more serious style. I am rubbish at promoting this blog so this probably won’t reach the people it needs to reach but if there are any steampunks out there who go to Lincoln and who also do art; please think about entering the exhibition next year. It is very difficult at first to put your art out there (and that’s probably why i paint jokes, so that i can laugh them off and not expect people to take them seriously) but really, nothing bad will come of it and it may even encourage you to do more, get better, stretch yourselves and that has got to be better for all of us. A Wee Dram for Burns Night? delanthear on Happy Ever After?